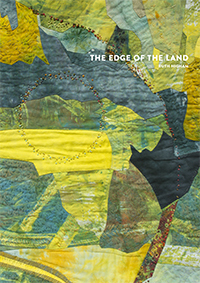 We are pleased to be taking orders for Ruth's book, The Edge of the Land. This book was written by Ruth to show how the creative process works. It is very personal, using extracts from some of her own sketchbooks through to images of her finished quilts and art pieces. The Edge of the Land is 96 pages long and has a soft cover. Please note that all copies include a donation of at least £5 which will go to The Beatson Hospital Cancer Charity as this was Ruth's wish. The Beatson Hospital cared for Ruth throughout her illness and continue to care for many people being treated for cancer. To find out more about the charity and the work they do click here. To order a copy of The Edge of the Land by Ruth Higham please select your donation amount and click on the BUY NOW button. If you require more than one copy you can edit the quantities on the next page. If you are outside the UK please note information below in the Delivery section. The prices above are for UK delivery. If you wish to order for a non UK delivery address please email us: book@ruthhigham.co.uk. This book could not have been finished without the tireless encouragement to Ruth and highly creative attention to detail, given by our very good friend Helena Stirling. Helena lovingly photographed all the pages of Ruth's sketchbooks and finished pieces. Following Ruth's exacting direction she has compiled this book on her behalf.